To say Spanish artist Santiago Sierra’s work is ‘interesting’ is to instantly place yourself in a particular constituency, to cast yourself as a member of an elite decidedly outside the work on view. You have the time and inclination to go see the work (as I did, in the major show on now at the Lisson Gallery), and the psychological and physical distance to consider it in a particular way. The labourers Sierra hires – usually paying them considerably less than minimum wage to perform ‘useless’, often uncomfortable tasks – have access to the work not really as a viewing public but as a participating public. The ‘workers and the unemployed’ to whom Sierra dedicates his Lisson Gallery show are his medium and his message, not his audience; the tension between these two publics is what gives Sierra’s work its urgency and its interest. The work Sierra is most famous is constantly described as provocative and sensational (those are the relatively positive descriptors). Since the late 1990s he has been executing projects like ‘160 cm Line Tattooed on 4 People’ (2000), in which he tattooed the backs of four prostitutes in exchange for the price of a shot of heroin. He has hired a man to spend 15 days living in a cramped space inside a wall at New York’s MoMA P.S.1 (‘Person Remunerated for a Period of 360 Consecutive Hours’, 1999). His work, the press releases patiently explain, is supposed to draw attention to the exploitative system of labour within capitalism by performing its most extreme manifestations. Beyond that lofty goal (humourless satire), the artist has defended himself against his critics on practical grounds: ‘Many of the people who make those criticisms have never worked in their lives; if they think it’s a horror to sit hidden in a cardboard box for four hours, they don’t know what work is,’ he told fellow artist Teresa Margolles in a 2003 interview in BOMB magazine. Sierra is here deliberately playing dumb, forcing you to answer your own questions: the work might be less physically uncomfortable for the worker, but is it more demeaning and alienating because it’s being performed as an art-work, an artwork that will likely be sold by a prestigious dealership for thousands of pounds? It seems to me that it is not more demeaning than ‘normal’ labour – it is equally demeaning, equally arbirtrary, equally estranged from the labourer performing it. The life of the action after its performance is likewise similar to work in the regular marketplace – the labour is traded, subject to speculation, and exchanged among people who had very little to do with its original processes. Sierra takes the systematic inequalities and injustices underlying even the most mundane transactions of daily socioeconomic life and makes them shocking, even as he re-commodifies them as pieces of art. 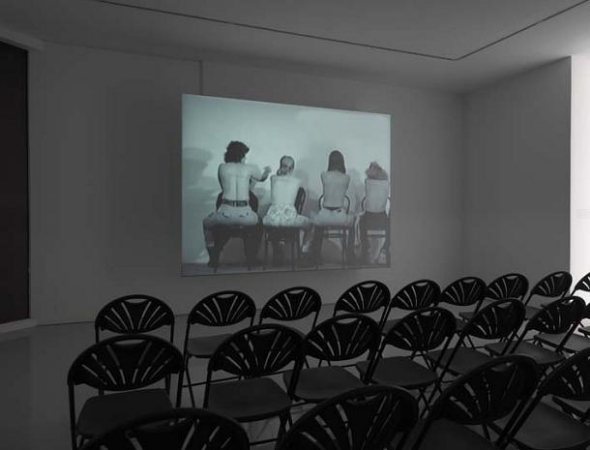 Display and curation then become crucial in the effect Sierra’s work has, and his practice is poorly served in this case by the overambition of the Lisson Gallery’s massive ‘retrospective’. Fifty-three videos are on view in a relatively small space; as most of the videos are at least an hour long, it would be literally impossible to see them all. 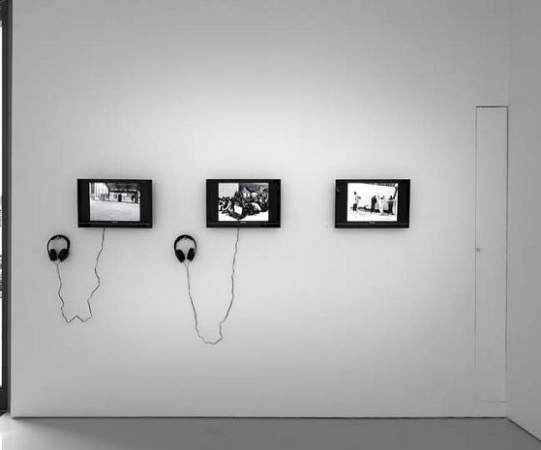 The pieces on view in the main gallery are shown according to a schedule that varies every other day and the front gallery has fourteen screens jostling for space (most of these are showing two or three videos on loop). And despite all the denunciations of sensationalism, Sierra’s work is expressed in a deliberate monotone – there is, as should be expected, very little action in ‘8 People Paid to Remain Inside Cardboard Boxes’ (which runs for one hour, fifty minutes) – meaning that watching the videos for even a fraction of their run-time is a challenge. You are clearly not meant to linger; you are clearly not expected to see very much of the work (which is not generally the purpose of a retrospective). One exception is the new work in the exhibition, ‘No Global Tour’, which is given its own space and plenty of chairs in front of it to encourage watching. 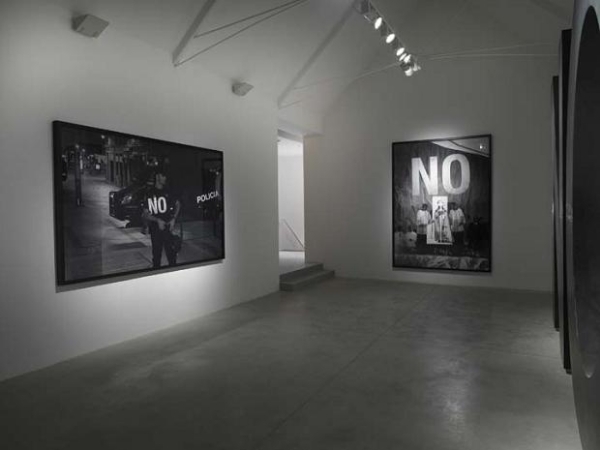 ‘No Global Tour’ is essentially a road movie of a massive rhetorical gesture of protest (a giant sculpture of the word ‘NO’ is strapped to the back of a truck and driven around the world over the course of two years); it is visually stimulating enough to hold your attention over its two hour run-time, if you make it to the rear gallery with the necessary time or energy. « Previous: Unknown Spins | Where’s the (musical) avant garde?